As an addition to the well known TwinOmatic Automatic Self Cleaning Filter series, we have introduced the TwinOmatic Brush as a more economical and robust alternative for standard strainers. 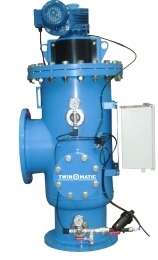 The TwinOmatic is a highly efficient and reliable self cleaning filter with a proven track record in the process industry. Its field proven cleaning technology operates fully automatically, eliminating the need for manual cleaning. Our unique brush design cleans 100% of the total filter area by physically removing the dirt from the screen. The collected dirt is then flushed out, resulting in a very effective cleaning. This standard TwinOmatic Brush type is electrical driven and controlled. During the automatic self cleaning cycle there is no interruption of the continuous flow, using only a minimum amount of flush water. Micron ratings > 200 micron are available. Higher design pressure and temperature. Stainless steel or delrin nozzles. Anti corrosion coating, specially for sea water (e.g. glass flake lining).